To date, the best use of augmented reality has been running around parks trying to capture virtual Pokémon. But as that fad has (mercifully) faded away, a company called AstroReality has come up with a more compelling use of AR technology that works with an astonishingly detailed replica of the moon that’s as much a work of art as it is a learning tool. This is the best way to explore the moon if you don’t have an Apollo-sized budget. 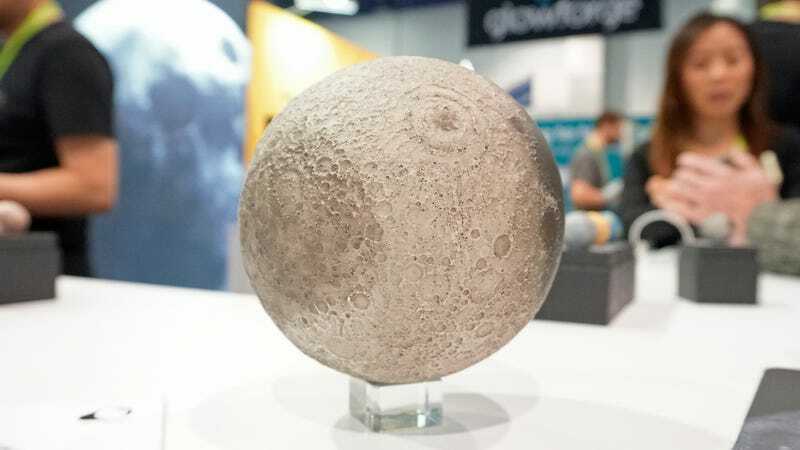 Using incredibly accurate and detailed topographical data captured and digitised by NASA’s Lunar Orbiter team, AstroReality has created a softball-sized replica of the moon that takes advantage of some of the best 3D printers on the market to recreate every last feature of our nearest celestial neighbour. The replica is hand-painted, but because the surface is 3D-printed, you can feel all of the moon’s craters as you hold it in your hand. It’s also made from a dense polyresin, and feels satisfyingly heavy when you pick it up. That’s probably enough to convince astronomy and space exploration enthusiasts to cough up $219 to put one of these replicas on their desks. (It’s also available in smaller $89 and $39 versions.) But AstroReality has created an accompanying iOS and Android augmented reality app that lets you explore areas of interest on the moon, including the names of countless landmarks, and the locations of all the moon landings we’ve made. The AstroReality AR app brings the Lunar replica to life with labels and factoids about the moon. 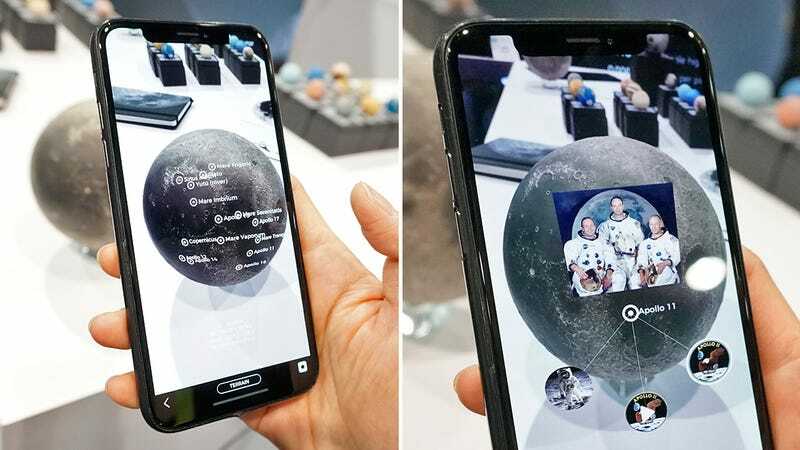 To use the AstroReality augmented reality app with the Lunar replica all you need to do is point your smartphone’s camera at the miniature moon and you’ll see all of the added details and descriptions via your smartphone’s screen. As you move around, all of the labels and pop-up video-esque tidbits move around in real-time as well. It tracks and works incredibly smoothly, and up until yesterday I had no real idea where Apollo 11 had actually touched down on the lunar surface. As an educational tool, it’s a fantastic use of AR. The rest of our solar system is coming too. 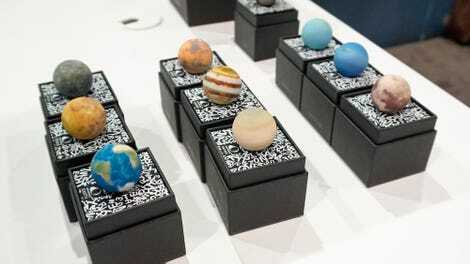 AstroReality is also creating replicas of other celestial objects in our solar system, including the Earth, in a nine-piece set that will set you back $129 (about £95). They’re considerably smaller and less detailed than the Lunar replicas (slightly smaller than a golf ball) and require the use of a special display stand for the augmented reality features to work. Whether or not the company produces larger versions of the planets remains to be seen, but hopefully one day you’ll be able to put the entire solar system on your desk.